Disclaimer: This article contains spoilers for Twin Peaks and Fire Walk With Me. One of the main complaints any die-hard Twin Peaks fan might have against Fire Walk With Me is that much of it does not take place in our beloved town. Instead, the entire Teresa Banks investigation occurs in a strange, hostile place called Deer Meadow. Despite the pleasant and peaceful image this name might conjure up, Deer Meadow is a rather ugly place, filled with unfriendly townspeople. One could say it is the evil Doppelganger of Twin Peaks itself. But why is Deer Meadow the way it is? In this article, I will analyze the town, its residents, and the rich symbolism that litters it, hopefully shedding some light on what is going on there. First, let’s take a look at the diner, Hap’s. There is so much symbolism here, it’s difficult to know where to begin. Hap’s, of course, serves as the Doppelganger of the Double R Diner, making (the late) Hap and Irene potential parallels to Hank and Norma, and Jack, the man Agents Desmond and Stanley talk to, could parallel Ed. First notice the neon sign outside of Hap’s: It’s a clown face, which ties into the clown (or Sacred Clown) symbolism of Twin Peaks, as well as the recurring motif of electricity. One side of the clown’s face is burnt out, suggesting dualism. It also looks like tears might be falling from the clown’s face. This image reminds me of Laura, trapped in what Lynch refers to as the “suffocating rubber clown suit,” living the party girl life, acting like she’s happy, while in reality, she is being split in two, and inside she is crying. When the agents enter the diner, they go to the back room, where there’s an electrician working on a lamp, which is sparking dangerously. In a version of the script, Stanley asks Desmond about why there was someone working on a lamp in Hap’s Diner, and Desmond replies that it is due to faulty wiring. Of course, electricity, in the film, is connected to the Dugpas and, therefore, the Black Lodge as well. Notice also the odd, door-like recess in the wall: This implies an opening to the Lodge is present, or perhaps used to be. Sitting in the “doorway” is a man, possibly a lumberjack. He looks remarkably similar to the Jurgen Prochnow lumberjack seen above the convenience store. If this was intentional, it would imply that there is some interference here from denizens of the Black Lodge. The agents speak to Jack, presumably the manager of Hap’s Diner (since Hap is dead, good and dead). Jack’s name tag reads, “Say Hello Goodbye, My Name is Jack.” He doesn’t seem to know much of anything about Teresa, and instead directs them to ask Irene. He warns the agents: “Now, her name is Irene, and it is night. Don’t take it any farther than that. No good will come of it.” This is, of course, a reference to the folk song, “Goodnight, Irene.” This reference also comes up in Mulholland Drive, which infamously takes place inside a dream (this is reminiscent of Philip Jeffries’ declaration that “we live inside a dream”), and features an elderly woman named Irene. In the background, we can see some interesting decor. One item of interest is a tree stump, with two chainsaws sticking out of it (one red, one yellow). Wood and lumberjacks are two recurring motifs in Twin Peaks, especially as we are shown that spirits can reside in wood. The chainsaws suggest the act of cutting. Perhaps this is a place where spirits can cut through, into another dimension? Also, notice the big fish mounted on the wall here. It looks to be a bass, but it could be meant as a reference to Fat Trout Trailer Park. It could also be connected to Lynch’s concept of “catching the big fish,” which means (roughly) searching for profound truths or ideas. In a sense, the agents are looking to catch the big fish by looking for the answer to this intricate mystery. One idea is that it has to do with the murder of a “little girl” happening twice: Laura and Teresa. It could also have to do with the distortion of time associated with the Black Lodge. If there is a portal to the Black Lodge nearby, perhaps even within the diner itself, this pair could actually be Dugpas. For whatever reason, Desmond doesn’t want to interview either of them, and no one really acknowledges the French woman. Next, let’s take a trip to Fat Trout Trailer Park. This is another interesting and very important place. The people here seem harassed, afraid, and disoriented, almost as if they have just woken from a long and terrible nightmare. The superintendent, Carl Rodd (Harry Dean Stanton), has most likely had his run-ins with the Black Lodge. Mr. Rodd is a fascinating fellow. He seems to be having strange nightmares, which might be robbing him of good sleep (needing to sleep in might be a reason he doesn’t wish to be disturbed before 9am). He appears reluctant to leave his trailer or interact with the tenants. They have left many notes on his door, but he never seems to bother reading them. He is haggard, and there is a band-aid covering some unidentified injury on his forehead. As we’ll discuss momentarily, he might know a little more than he lets on. Then there is the woman with the ice pack, who wanders into Teresa’s trailer while the agents are investigating it. I would like to note here that in an early draft of the script, this woman was leading Deputy Cliff to where the agents were. It could be that, originally, she had the ice pack because Deputy Cliff assaulted her to get information on the agents (it’s already established that the law enforcement in Deer Meadow is not well-liked by the townsfolk; this could be why). However, it is curious that, once the scene with Deputy Cliff was removed, Lynch and Frost would choose to leave in the scene of the woman with the ice pack, with seemingly no explanation. I believe that, in this new version, it is meant to be inferred that the woman has also been having experiences with the Black Lodge, possibly even BOB himself, and this is the cause of her injuries. He looks to Agent Desmond as if hoping he understands his meaning. He doesn’t want to explicitly state what he means, perhaps for fear of being thought of as crazy. Some people believe he means that he has spent time in jail or prison, and doesn’t want to go back. Perhaps he fears being accused of Teresa’s murder. However, this doesn’t completely fit. Why would the woman with the ice pack generate a fear of prison in Mr. Rodd? Why the shot of the pole, traveling up towards the electrical wiring? It would make more sense if Mr. Rodd is referring to having visited the Black Lodge. Mr. Rodd knows that strange things are happening in the trailer park. Strange beings appearing out of nowhere and attacking residents, electrical disturbances, voices heard out of thin air, bizarre dreams haunting the people in the trailer park, normal people suddenly acting strangely, perhaps other tenants that have disappeared. However, being a very simple man, he doesn’t understand any of this. He only knows what he’s seen, but fears that he is going crazy. He doesn’t want to tell anyone, because a) they might think he’s crazy, or b) it would mean having to acknowledge what is happening, which might mean confronting it, which would cause more trouble for him. Instead, he hides in his trailer and tries to ignore the bizarre nightmares and upset tenants. He has probably accidentally stumbled into the Black Lodge at some point, either in a dream or through a portal in waking life. The experience terrified him. He’s afraid of getting trapped there; he just wants to stay where he is. Also in an early draft of the script, Mr. Rodd says that he was having a dream of “a joke with no punchline.” Almost immediately afterwards, Desmond and Stanley discuss Deputy Cliff and refer to him as “a clown.” This ties in with the Sacred Clown symbolism that proliferates the movie. Essentially, the symbolism says that the Dugpas are (or are related to) Native American trickster spirits which sometimes use clowning to impart important knowledge to humans, but sometimes also just cause chaos for fun. This is yet another tie between the trailer park and the Dugpas. I would also like to make a brief observation in regards to Mr. Rodd’s name, which always made me think of a conducting rod. Could be another connection to electricity in the film. And then, of course, there are the Chalfonts. Now, the Chalfonts are, presumably, the Tremonds. They are described as being a woman and her grandson, and they once again have a French surname. As we know from Twin Peaks the series, they are not humans. They seem to be spirits from one of the Lodges, acting in a manner similar to the Man From Another Place and the Giant: Appearing to humans and giving them clues to “help” them catch BOB. (Whether or not they are truly “helping” is a tricky question we will have to save for another article.) We also see a pattern in their behavior: They occupy a space, and take the last name of the people who live there, or used to live there, causing some confusion. Before, they seemed to change reality itself, altering the interior of the home of the real Mrs. Tremond and placing a fake order to Meals on Wheels the lure Donna there. This time, they seem to have waited for the real Chalfonts to vacate their space at the trailer park, then taken their own trailer to occupy that space. These spirits seem to only appear when someone is about to die. They appear to Laura in a dream shortly before her death, then they appear to Donna before Harold Smith commits suicide, and finally they turn up in Teresa Banks’s trailer park before her death. They may simply be appearing to predict a death, as with Harold’s, or they may actually aid in facilitating it, as they seem to have a suspicious level of involvement with both Laura and Teresa around the times of their murders. Or, perhaps they are chasing BOB? Later, Agent Desmond returns to the trailer park to see Deputy Cliff’s trailer, suspecting the corrupt deputy of having Teresa’s ring, but instead diverts his path. While looking at the electrical pole with the number “6” on it, he hears the Indian whooping call on the wind. He turns around and sees a trailer with its lights on, and heads over. He knocks on its door, but no one answers. Underneath the trailer is a pile of dirt and Teresa Banks’s ring: The one with the green stone and the Owl Cave symbol on it. Desmond reaches for the ring, and disappears. When Cooper visits the trailer park later, he feels compelled to walk over to an empty space. This is where Desmond disappeared; now, the trailer is gone. We learn that this space was owned by the Chalfonts, which further links the trailer park with the Black Lodge. The space left by the vacant trailer seems to be soaked with engine oil: similar to the entrance to the Black Lodge found in Glastonberry Grove. A glance at Agent Desmond’s car reveals the words “Let’s Rock” have been written in red across the windshield. Of course, these are the first words spoken to Agent Cooper by the Man From Another Place. This would seem to confirm that Desmond has disappeared into the Black Lodge. But why is all this happening here? Deer Meadow is riddled with portals to the Black Lodge. There are Dugpas all over the town, mostly unnoticed by residents. However, the trailer park seems to be a hotspot for attacks, particularly near the telephone pole bearing the number “6.” It would make sense that BOB, having had a fixation on Teresa, frequented this area, probably harassing her neighbors at the trailer park. We’ve seen how much of Deer Meadow is a parallel of the more familiar town of Twin Peaks, and there may be a deeper reason for this than we at first suspect. Deer Meadow represents the dismal bitterness and distrustful nature that Twin Peaks itself might descend into as a result of its victimization by the denizens of the Black Lodge. After many years of torment, nightmares, and living in fear, one could imagine that even a town as idyllic as Twin Peaks could become a grim place, broken by crippling fear, and sacrificing its innocence to suspicion, cruelty and criminal behavior. Throughout the TV series, we fear our beloved town will fall prey to its dark side: Corrupt business men, drug dealers and pimps all populate the shadows of Twin Peaks. There is a battle, both literally and figuratively, between the light and the dark. Deer Meadow is a town that has been overcome by the darkness. The circle of Sycamore Trees at Glastonbury Grove, where the entrance to the Lodges is located. A circle of trees… A golden ring… A spinning ceiling fan… A gem with a mysterious insignia… A phone with a little ring… A circle of burning candles… A beautiful girl’s ring… A cycle of appetite and satisfaction. 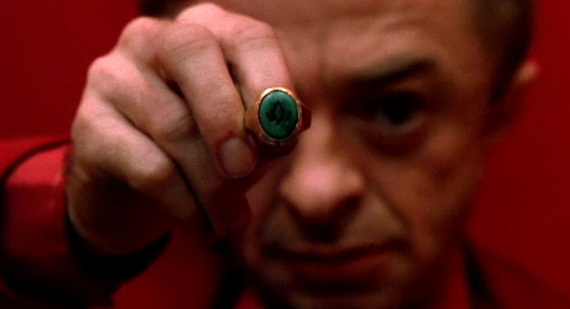 There are many rings, and references to rings, in Twin Peaks; The ring with the Owl Cave insignia on it (which for the sake of brevity we will call the “Owl Ring”); Cooper’s ring, which the Giant takes and returns to him once the killer’s identity is revealed; Audrey’s query to Cooper, “Do you like my ring?” But what does all that mean? Some of them are arguably less significant than others, but, according to my theory, any small reference to “rings” or “circles” is there to reinforce the importance of the more overt ring symbols. In this article, we will focus on the meaning behind these symbols, and what is perhaps the true meaning of the Owl Ring. The Little Man From Another Place holding the Owl Ring. We already know that the Owl Ring is associated with BOB, MIKE and their victims: Both Teresa Banks and Laura Palmer were wearing it before they died, and Annie Blackburn returned from the Black Lodge with it on her finger. Agent Chester Desmond, in his investigation into Teresa’s murder, discovers the Owl Ring, and afterwards, disappears. 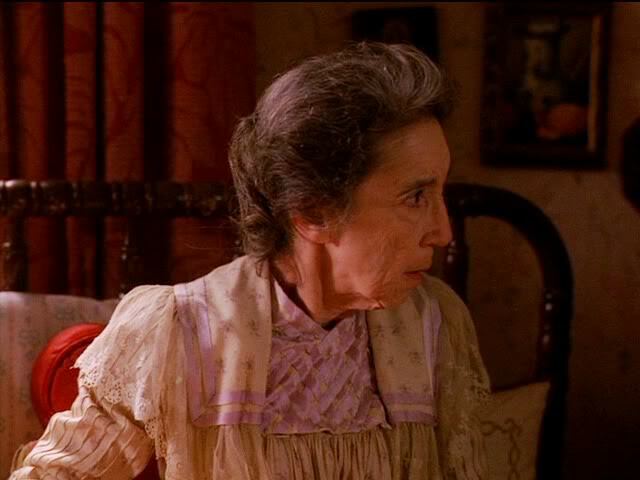 In Agent Philip Jeffries’ flashback, we see the Little Man from Another Place put the Owl Ring on the green Formica table and say: “With this ring, I thee wed,” after which Mrs. Tremond’s Grandson/the Chalfont boy points at BOB and says “Fell a victim,” which may be an order, or a statement. I believe it was an order. Mrs. Tremond expresses her dislike of creamed corn to Donna. It is my theory that the Chalfonts are the Black Lodge Dopplegangers of the Tremonds: The Chalfonts are working only to aid in the collection of more Garmonbozia, manipulating Laura and making it easier for her to slip into BOB’s clutches (I believe the painting they gave her is designed as a kind of trap), while the Tremonds give Donna clues about the identity of Laura’s killer. 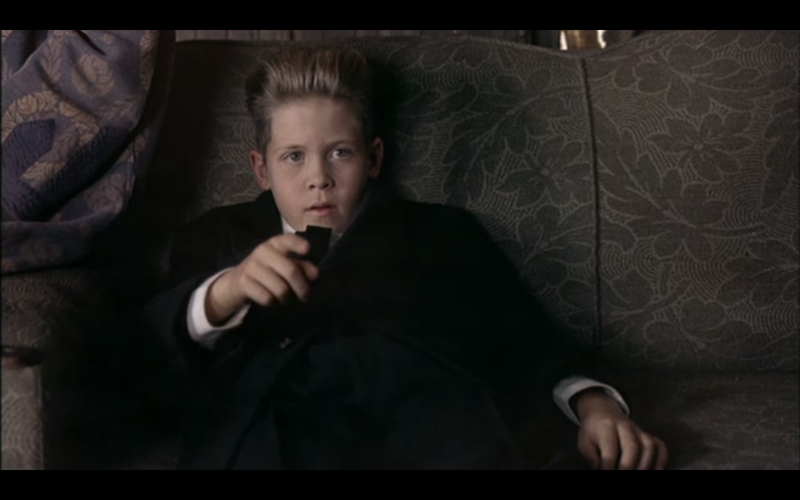 In Jeffries’ vision, we are seeing the Chalfont boy participating in the Black Lodge ritual and commanding BOB to go fetch them more Garmonbozia. 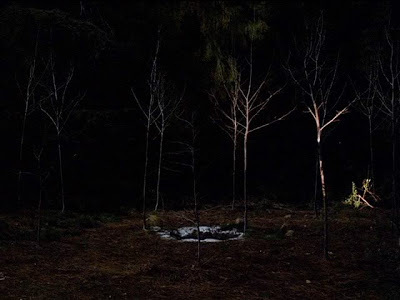 We know that circles are often used in real-life rituals, and we even see MIKE ritualistically chanting “Fire Walk With Me” as he lights a circle of twelve candle, mimicking the circle of twelve sycamore trees surrounding the entrance to the Lodge in Glastonbury Grove; an entrance which can only be opened by a ritualistic act of either Love or Fear. It seems to me that the multiple mentions of “rings” and “circles” implies a cyclical nature to these ritualistic killings: In these almost ritualistic murders, there is always a Killer (BOB inside of a Vessel) and a Victim, to whom he is wedded. As long as Laura did not put on the ring, she would not be the Victim: She would be the Vessel for the Killer. However, once she put the Owl Ring on, she was ritualistically wed to Killer BOB, and thus had to be murdered, in order to faithfully complete the ritual. It appears that there is some law that the denizens of the Black Lodge must follow, binding them to the rules of this feeding ritual. Once the Owl Ring has been placed upon the chosen Victim’s finger, the Killer must execute them. Agent Chet Desmond finds the Owl Ring in a mound of dirt underneath the Chalfont’s trailer, so presumably another ritual was taking place, had taken place, or was about to take place there. This may have been where Teresa’s sacrifice was made, as she was killed very nearby in her trailer, or it may have been set in order to sacrifice Desmond himself. But if Desmond was not sacrificed, then what happened to him? Why did he disappear after finding the Owl Ring? Judging by what we already know about the Black Lodge, he most likely slipped into that world, and became trapped there, as Agent Cooper eventually would. This is, perhaps, also part of the ritual cycle: A detective investigates the murder of a woman, and the detective goes missing. Theoretical examples of this would be Teresa Banks/Chet Desmond and Sam Stanley, Laura Palmer/Dale Cooper, and Judy(? )/Philip Jeffries. MIKE performs the Fire Walk With Me Ritual. Taking this theory further, it is a possibility that Audrey’s reference to her ring may have been an early foreshadow to the purpose of the Owl Ring: To indicate who BOB’s next victim would be. This was meant, according to my theory, to reference early on the fact that Audrey would eventually be BOB’s intended victim, after he had possessed Evil Cooper (This is before the character of Annie was made up to take Audrey’s place). The question is where MIKE fits into this ritual. He refers to BOB as his partner, and says that they killed together, which implies that they both played the role of Killer. Another possibility is that BOB was more of a servant to MIKE; he executed the Victim on behalf of MIKE, and delivered the Garmonbozia to him. In Cooper’s dream-vision, MIKE portrays himself almost as having been enslaved to the killing impulse until he cut his left arm off. The left arm may be a significant choice here, as it references not only the “Left-Hand” or “Sinister” Path, but also the ring finger, which in American tradition is on the left hand. In the final episode, as the path to the Black Lodge is opening up, Cooper, Pete, and a woman at the Double R experience tremors in their hands as a sort of presentiment. Major Briggs also, arguably, experiences this hand tremor when he is picked up after having been injected with truth serum: Both hands (and indeed his whole body) are shaking, but, when he is in the sheriff’s department, he is holding up his left hand, with his wedding ring on it, against his face, which may be reinforcing the significance of the ring finger in Twin Peaks’ symbolism. (Interesting note: Cooper, Pete and the woman at the diner all experience tremors in their right hands.) We have seen that MIKE wore Owl Ring on his right pinky finger while showing it to Laura: Is it possible that, before he cut off his left arm, he wore the evil ring on his own left hand during these times? And is it possible that wearing the Owl Ring is what allowed MIKE to possess Philip Gerard in the first place? We can only speculate. Two more important elements to note are the cycle of the planets and time loops. The cycle of the planets is of great significance to the Lodges and its residence, as it is by watching for certain alignments that one may know when the portal to the Lodges will open. We may also speculate that it was important to them because certain rituals could or should only be performed during certain alignments (think of the Pagan Sabbats, for example, which are celebrations taking place during certain planetary alignments). Time loops are also a noticeable aspect not only of Twin Peaks, but in many of David Lynch’s films. Fire Walk With Me is notoriously both a prequel and a sequel to the series, as events that occur both before and after the events of the series take place in a very disorienting manner. How is Annie Blackburn seen in Laura’s bed, speaking words she says after the events of the series finale? How is Dale Cooper already in the Lodge, speaking to Laura in her dream? How is Cooper an old man in the Lodge, while Laura is still a young woman? The answer is: Because time is not linear in the Lodges, as it is in our world. When it comes to the Black Lodge, time twists and turns, and when it interacts with this world, it may be that time loops and warps are a symptom of its interferences. This may be how Cooper and Annie are able to speak to Laura across time, and Cooper is seen as old, while Laura appears to still be young (although there may be other explanations for these instances). Hence the “ring” symbolism could also refer to the all-important cycle of the planets, as well as the bizarre time loops cause by the Black Lodge. The full Owl Cave symbol. A final question: What is the significance of the symbol emblazoned on the ring, and why is it the same as the petroglyphs in Owl Cave? Well, it seems that the Black Lodge’s occupants have been crossing into this world for some time: They seem to have had encounters with the Native Americans, working their way into their folklore, which Hawk recounts to Agent Cooper. In the early days of their journeys into this world, the Dugpas may have had encounters with early humans, who then drew what they had seen onto the walls of what would become Owl Cave. Another possibility is that an early incarnation of the Bookhouse Boys is responsible for the drawings and strange mechanisms in Owl Cave. It is implied that the Bookhouse Boys have known about something deep in the woods for some time now, though they may never have been entirely sure what it was. They may have learned about the Black Lodge and its occupants, and hidden the information in Owl Cave, so that future initiates could find it if need be, and so the information could not be misused by those with an evil heart, such as Windom Earle. Whatever the reason was, it is most probable that the symbol has been used by the Dugpas for ritualistic purposes for centuries. It looks like a stylized owl, and though that interpretation is accurate, we all know that the owls are not what they seem, and therefore, neither is the symbol. 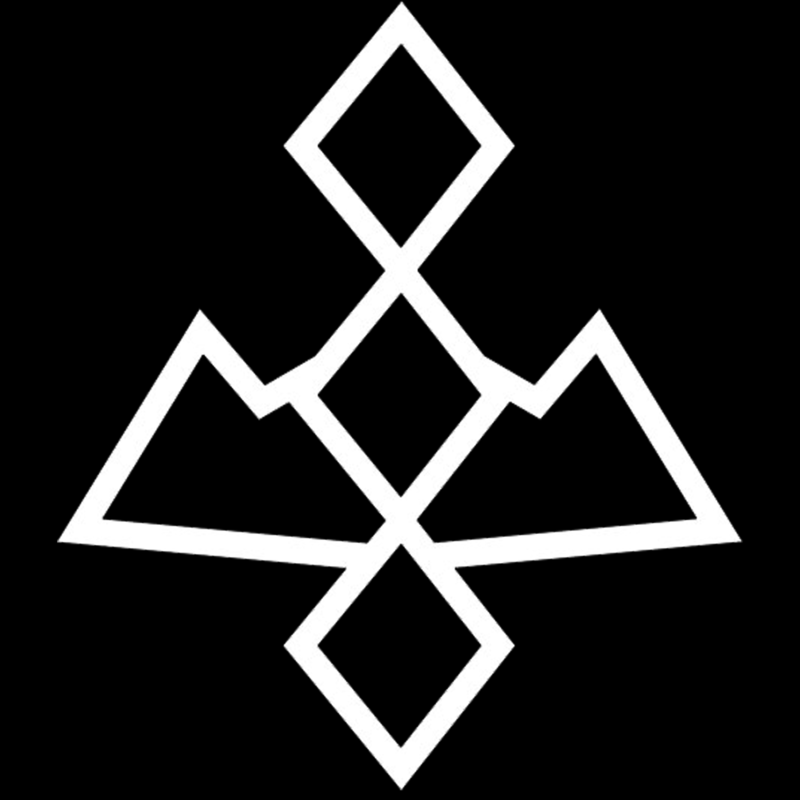 I believe that the symbol can also be interpreted thusly: The “wings” are the Twin Peaks which give the town its name, and the diamond shape between them is the portal to the Lodges. Another important thing of note: Tibetan Buddhism uses the idea of karma, which, among other things, plays a large role in the death experience, and controls what happens to a person when they die. If you are a good person, who chose wisely, acted kindly, and chose the path of love and light, then you would ascend to a higher level when you died. If, however, you lived as a cruel, ignorant or violent person, you could get caught in a karmic circle of pain and suffering, and be forced to reincarnate over and over again, until you evolve spiritually and become a better person. By choosing not to face his shadow self, and instead running from him in fear, Cooper was choosing the lower path; the path of fear and ignorance. Thus, instead of finding his way safely through the Black Lodge, he was trapped in a loop, unable to escape. In summary: The Black Lodge denizens participate in an ancient ritual; a cycle of blood sacrifices. As part of the ritual, they created a special ring (the Owl Ring) to mark their chosen sacrifices. These sacrifices result in the production of Garmonbozia (pain and suffering), which the Dugpas feed upon. The various ring and circle symbols scattered throughout Twin Peaks reinforce the significance of this object to the central storyline. 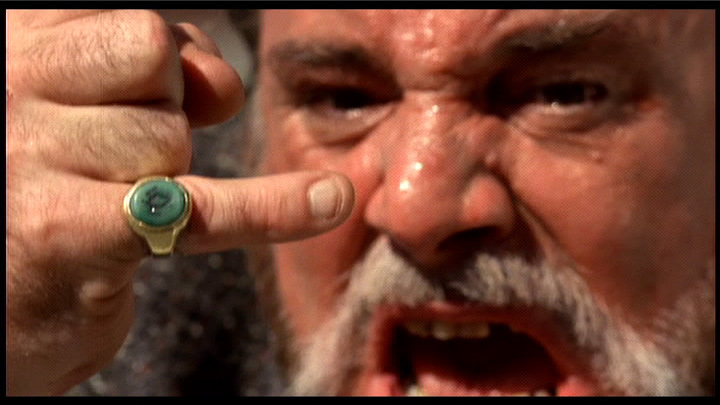 By taking Cooper’s ring, the Giant was not only giving him a sign that he’d finally found the killer, but was also giving him a visually key with which he could decipher the rest of the mystery. Too bad he didn’t get the chance before the series was cancelled. But with Showtime’s revival of Twin Peaks in 2016, there is a chance the Giant’s clue may not go entirely unnoticed.